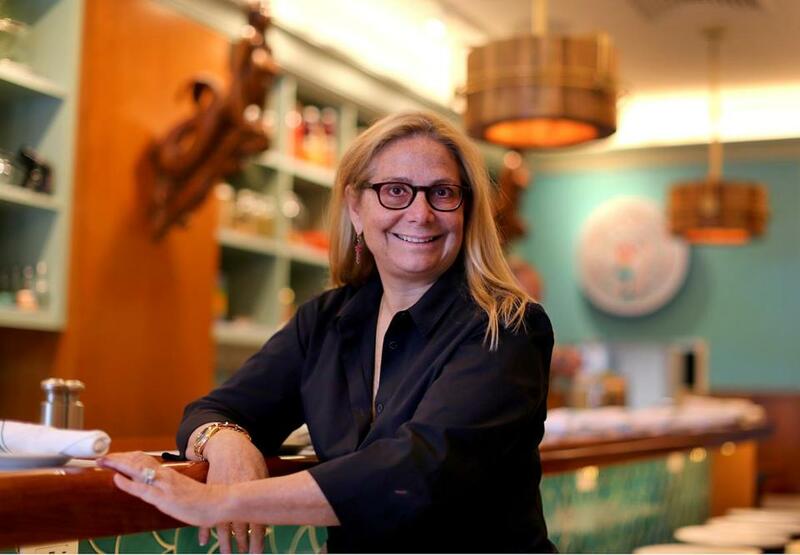 It’s appropriate to feature Kathy Sidell in the Getting Salty column: She runs Back Bay tinned-fish haven Saltie Girl, a raucous little corner where bankers, seafood-loving socialites, and curious suburbanites feast on towers of oysters and throw back cocktails like the world’s on fire. She also oversees the Met group of restaurants: Met Back Bay, Dedham’s Met Bar and Grill, and Nantucket’s Met on Main. Food is the family business: Her father, Jack Sidell, was a restaurant financier who gave chefs like Todd English a start. Her sister, Stephanie Sidell Sokolove, is the Stephanie behind Stephanie’s on Newbury, among other namesake city spots. Here, Sidell opens up about supermarket sushi and Chinatown delights. What’s the first restaurant you ever ate at in Boston? House of Roy was my dad’s favorite, and it was kind of like an every-other-Sunday-night ritual. They had this tomato shrimp dish that was epic, and I remember it well, because I don’t think you can get that dish anywhere since. And sweet-sour pork! It kind of had this candied glaze over it. My family had this thing about ordering it with no cherries. It was awesome. What’s one thing you’d like to fix about the restaurant industry here? I would like to see restaurants stay open later and have a livelier, almost European vibe. Somehow people aren’t out on the streets past 9 p.m. You go to Rome, or anywhere where you’re traveling, and people eat late, and they’re loving life. That feeling should exist here. You could create that with Newbury Street, with outdoor dining. It would be so awesome to have that feeling. How has the restaurant landscape changed since you arrived in Boston? It has changed dramatically. Now you’re seeing a lot of restaurants pop up that are authentic to the chefs or restaurateurs that are creating them. There’s an ode to the past, their mother, their heritage. The authenticity in that is remarkable. People want to share the food they love. It feels good, and it tastes good. Look at Sarma or Mamaleh’s. Now we have a little enclave of authentic places. What other restaurants do you visit? I do Chinatown because I live right next door. Peach Farm does that crispy chicken and a crispy sesame noodle that is killer. They make a really hot sauce for me with jalapeno, cilantro, and soy. I like it spicy. Or else I’ll get the whole Dungeness crab. I eat at Mooo a lot, probably more than any other restaurant. It’s really good, consistent, and my favorite go-to. Oh! And I like Bar Mezzana. The pasta is very, very good. And I go to Tiger Mama when I feel like a fatty-cake. The short rib is phenomenal. I’m actually going tonight. What’s your earliest food memory that made you think, “I want to work in restaurants?” I was in the Bahamas with my mom. I went to a magical restaurant on the water and had duck for the first time. It was like I was in an enchanted land. The wait staff, the evening breeze, the food . . . it was magical. I think I was in seventh grade. What’s the worst restaurant experience you’ve ever had? One of my weirdest meals was at the Capital Grille. I was wearing white jeans and a white shirt, and they spilled my entire glass of wine on me and then charged me for it, and the next one they gave me. But I love them. It’s my old stomping grounds, but this happened there, several years back. We also had a crazy meal at the Club Car in Nantucket [a while back]. The swordfish was notorious. It had pecan crust. Melt-in-your-mouth fabulous. We all went to cut into it, and it was frozen. We sent it back, and the maître d’ was like, “We don’t need your business. We don’t care. Don’t eat it, and don’t come back!” It used to be one of my dad’s favorite places. How could Boston become a better food city? I think it would be awesome to have a hybrid of Dean & DeLuca and American Provisions, something really curated and that addressed what people need — an awesome pantry place. I buy this incredible tahini online. Best you ever had. It changes how hummus tastes. I have to buy it on Amazon. It would be awesome to have the best tahini in the world. That’s my fantasy. No doubt. I dream about stuff like that. And it’d be awesome if Boston had more of a cocktail scene. I go to LA, and the Varnish, and the Roger Room, it doesn’t matter where you go, these places exist, and they’re cool and magical. I know Michael [Scelfo] is doing Longfellow, and I don’t know the food component of that, but I feel like, God, it would be great to have awesome cocktail lounges. I miss that. That’s why I go to the Four Seasons. There needs to be like, a Baldwin Bar [in Woburn] here. Epic. Just do five dishes, and I’d be happy. Name three adjectives for Boston diners. Loyal when you garner their trust. I think they’re not terribly adventurous. They like what they like, how they like it. And brutally honest. What’s the most overdone trend right now? Oh my God. Sushi in supermarkets. No, no, and no. And these damn poke places! I worry about the quality of the fish. What are you reading? I’m reading about the Cocoanut Grove fire, which I am deeply fascinated by. I think it’s an extraordinary story. And I’m an Instagram freak. Fewer words, more images! What’s the one food you never want to cook again? Beets. They’re a mess. Doesn’t matter if you bake, boil, or steam them. Your hands are disgusting. Your countertops are stained. It’s just that they’re impossible to cook in any clean fashion. What kind of restaurant is Boston missing right now? I think we’re lacking authentic Middle Eastern, like Zahav [in Philadelphia]. I love Sofra. I love Sarma. A little more of that would be great in the city. What’s your most missed Boston restaurant? Stella’s in the North End. Again, I went there a lot with my dad. It felt like a great, old-school place with Italian waiters. It had fabulous Italian food, or at least I thought it did. I’d love to taste it again today to see if it’s as good as I remember. They made scampi tableside. It was really romantic. I can’t think of an Italian restaurant that has that kind of romance and that Sinatra-esque feeling. It’s of an era gone by, you know? [And] Olives was more than just a great restaurant. The evolution of the restaurant paralleled the growth and birth of chef-driven restaurants in the city back in the late 1980s. Of course, my dad was very helpful in financing many of them: Jasper’s, Hamersley’s, Olives. But Olives was happening. It was electric. The food, the vibe, the energy, and that molten cake. It was a magical moment in time. Who was your most memorable customer? I could write a book about the characters in my life. We had a couple that were extraordinary. Tough but fair. He drank Macallen, and so we would have his drink for him, and something like on the 1,000th time they were there, we got him the special Scotch he drank. They never came back again. How weird is that? It was almost as if they didn’t want to be acknowledged. We bought them a gift, and they never came back! What did we do wrong? If you had to eat your last meal in Boston, what would it be? It would be Chinese, for sure. I would do a duck in Chinatown, a whole fish, crispy noodles, and I would [get] dulce de leche cream puffs from Beard Papa. They’re so good! Damn, are they good! Everyone’s addicted.